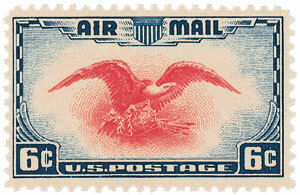 US #C3 was the first airmail stamp, used on the first flights 100 years ago today. 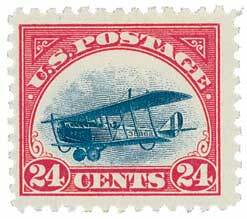 On May 15, 1918, America’s airmail service began when two Curtiss Jenny’s departed New York and Washington, DC. As a new form of transportation, early flight was a pioneering effort that suffered from a near-complete lack of precedent. More than a decade after Orville Wright’s historic 1903 flight, aircraft mechanics, instructors, and flight schools were still virtually non-existent. But as World War I engulfed the globe, many were soon convinced that air supremacy was the key to victory. 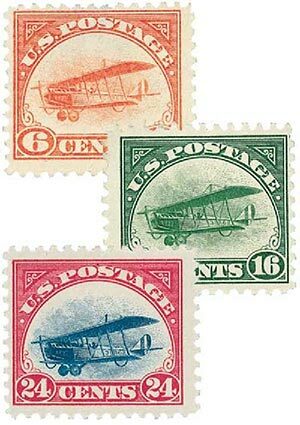 US #C1-3 – The first three airmail stamps issued in 1918. Many great innovations and improvements to aircraft followed, and by 1918, the US had a fleet of Curtiss Jenny’s that could fly at a top speed of 80 miles per hour with a range of 175 miles and could maintain an altitude of 11,000 feet. Meanwhile, the possibility of airmail delivery had been debated and dismissed for nearly a decade. So it came as a surprise to many when Postmaster General Burleson suddenly announced that service would begin between New York City, Philadelphia, and Washington, DC. The year was 1918 and the world was at war. Critics argued that every available resource was needed to win the war – including planes and pilots. However, Burleson brokered a deal with the War Department on March 1, 1918, that satisfied a very important military issue. Experienced pilots were scarce. America’s most seasoned pilots were serving overseas, leaving few opportunities for training new recruits. Under the new arrangement, the Postal Department would handle their traditional tasks and the military would provide the planes and pilots. Americans would have a rapid system of mail transportation, and military pilots would receive badly needed flight training. Major Reuben H. Fleet, an Army executive officer in charge of planning instruction, was placed in charge of making the necessary arrangements. Fleet received his assignment on May 6 – just days before the scheduled May 15th flight. 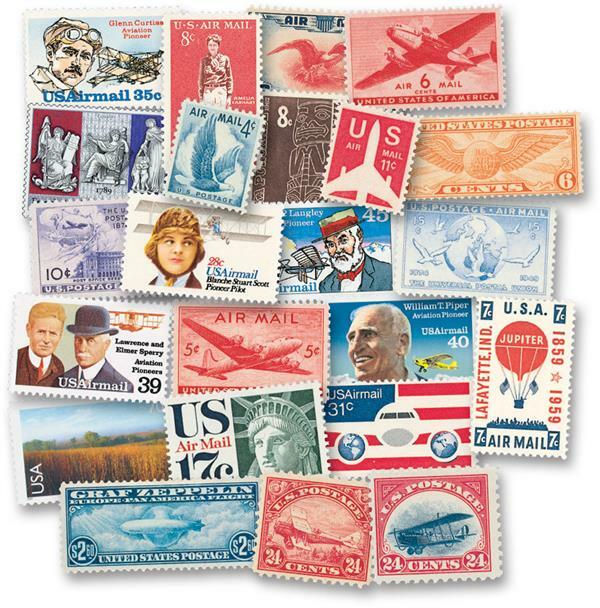 US #C1-C150 – Complete set of 153 US airmail stamps with FREE mounts. The plan for the first regularly scheduled flights in US aviation history seems simple by today’s standards. One plane was to depart New York and fly south at the same time a second plane flew north from Washington, DC. The planes were to meet in Philadelphia to exchange mailbags and refuel before returning home. On the morning of May 15, 1918, a crowd of several hundred gathered at Washington’s Polo Grounds to witness history being made. Lt. George Boyle climbed inside the Jenny with bags containing 5,500 letters destined to fly on the first airmail route in US history. As President Woodrow Wilson looked on with a crowd of dignitaries, mechanics tried to start Boyle’s plane. The propeller turned but the engine wouldn’t start. After four attempts, mechanics checked the gas tank and realized the plane was out of fuel. Furthermore, there was no gas on the field, so mechanics quickly siphoned fuel out of nearby planes. Boyle flew off for his journey to Philadelphia at 11:46 a.m. – 45 minutes late and barely clearing nearby trees. 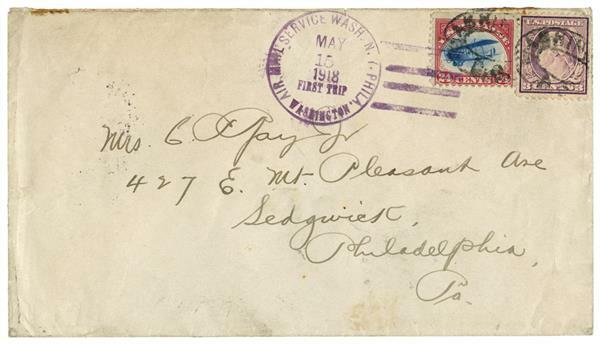 Item #MA1794 – First flight cover sent to Boston on June 8, 1918, on the first day of service to that city. This is a unique cover – we only have one – so order early to make it yours. Hours later, officials would learn that Boyle had flown in the wrong direction and crashed his plane. Instructed to follow the train tracks north, Boyle had become disoriented and used a southeastern branch of the track as his guide. Although Lt. Boyle escaped injury, his plane was lying upside down in a field near Otto Praeger’s country home, much as it appeared on the legendary inverted stamps! The mailbags aboard Boyle’s plane were quietly brought back to Washington, DC, and flown to Philadelphia and New York City the following day. Item #MA1791 – First flight cover that was in the Boyle crash. This is a unique cover – what you see is what you get. We only have one – first come, first served. Meanwhile, Lt. Webb had left New York and arrived safely in Philadelphia. His mailbags were transferred to the waiting plane of Lt. Edgerton, who arrived in Washington, DC, at 2:20 p.m. After two weeks of intense preparation and high drama, America’s first airmail service was established. In the months that followed, pioneering aviators expanded airmail service, flying by the seat of their pants over the treacherous Allegheny Mountains to Chicago and eventually the west coast. US #C23 was issued in Dayton, OH, the home of the Wright brothers, and St. Petersburg, FL, where the first passenger flight was made. Twenty years after that legendary first flight, airmail and air travel were still a novelty to most Americans. 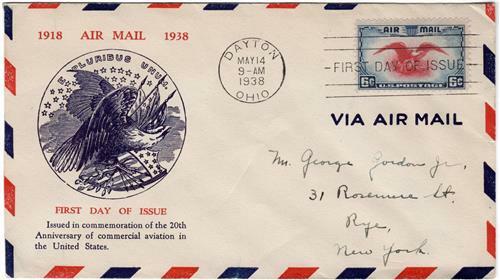 To help struggling airlines and boost airmail service, Postmaster General James A. Farley created National Airmail Week to run from May 15-21, 1938. The event was heavily advertised with the slogan, “Receive To-morrow’s mail To-day!” Farley also encouraged everyone in the US to send a letter during that week. To mark the occasion, a new 6¢ stamp designed by President Roosevelt was issued on May 14. Towns were also invited to create their own special cachets for mailing during the week. Nearly 10,000 cities participated and in all, more than 16.2 million letters and 9,000 packages were mailed during National Airmail Week. US #C23 – Classic First Day Cover. 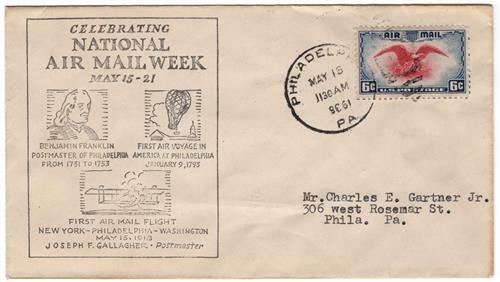 US #C23 – Commemorative cover with National Airmail Week cachet. Click here for more airmail stamps. 4 Responses to "This Day in History… May 15, 1918"
Good article, nice history lesson. Thank you Mystic. Yes, there was lot of information here that I had not heard before – a well-written story of that momentous occasion. I can imagine the chagrin of the northbound pilot at his poor performance! Lt. George Boyle… can`t seem to find any monuments or Army posts named after him.